This case serves to remind oral health care providers of the importance of locating a foreign body presumed to be ingested during a dental procedure. Figure 1: Radiograph indicates location of the 20 mm stainless steel dental post (arrows). A 58-year-old male was undergoing treatment for a dental crown when he accidentally ingested a 20 mm stainless steel post intended to support the prosthesis. The patient did not display any signs of distress and was referred to a hospital emergency department to determine the location of the object. 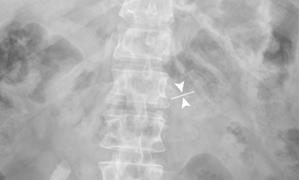 Imaging revealed the post, described as a “needle-like object,” overlying the mid-abdomen (Fig. 1). The patient was instructed to monitor for spontaneous passage of the object. The patient did not develop any complications, such as hemorrhage, infection, intestinal obstruction and/or perforation, and was unaware if the object had passed spontaneously. However, subsequent imaging of the abdomen revealed the object was no longer present.